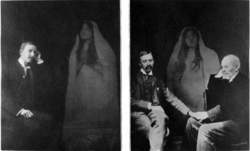 Spirit photographs taken by English photographer Richard Boursnell, c. 1891. Courtesy Fortean Picture Library. As a nineteen-year-old photographer in Fleet Street, London, Richard Boursnell was frustrated when unexplained markings began to appear on his photographic plates when the pictures were developed. His partner was unhappy at the expense and accused him of not cleaning the plates properly. This eventually led to the two parting company. Boursnell had no idea how the markings got on the plates, and decided to stop working in photographic processing. He kept to that decision for forty years. In 1903, the Spiritualists of London presented Boursnell with a testimonial signed by a hundred representative Spiritualists together with a purse of gold, to show their high esteem of him and his work. The walls of the Psychological Society, where the presentation took place, were hung with three hundred chosen photographs of spirit “extras” taken by Boursnell.